The rain has stopped in East Texas, but the humidity is here with ridiculous intensity. When traveling back and forth between Central Texas and the Reserve, there has to be at least a 30% difference in humidity and not in a good way! Our building crew is from Kentucky and Ohio and this heat/humidity combo are making it quite difficult for them to work without “wilting.” They have smartly decided to begin work at 6 am; stop about 11 am to noon and return to work when the temps begin to drop. But even with an odd work schedule, they are making incredible progress. 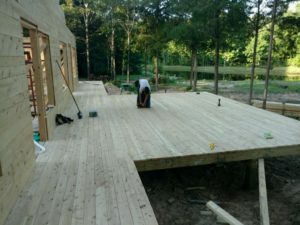 The decks for all of the porches are complete and the vaulted wall areas are nearly complete. Interior walls are being framed. 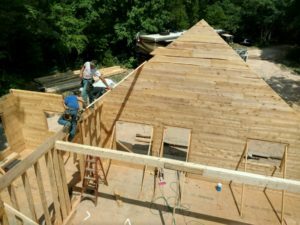 A few rafters are installed. Thus, we are getting excited about all we are seeing. We have made a decision about the stone for our fireplaces and for the exterior of the crawl space foundation. Real stone is extremely expensive these days because there are fewer and fewer stone masons in the U.S. and preparing it for application is very labor-intensive. For instance, the hubby guesstimates that we’d spend about 3 times as much for real field stone as opposed to our selection of cultured stone. We’ve also selected our fireplaces. The one inside will be a bit smaller, because we have yet to build a fire in our own indoor fireplace at our home of 23 years! But, have we used a cheapo fire pit from Walmart outside? Oh. My. Yes! So, the outside fireplace will be larger. For fireplaces, one has to decide gas, electric or wood-burning. The electric options are really cool-looking, but don’t really look right in a log cabin. We were pretty sure we wanted wood outdoors, but we’ve gone back and forth about gas inside. It creates less mess, but the fake logs do not really look realistic, driving us both crazy. We decided to do the required work to have gas as an option for the inside fireplace in the future, but will just use wood for now for both. One also gets to decide how high and wide the opening will be; the firebox depth; the pattern and material for the firebox; and chimney cap options. How much do I care about this? About a 3 on a scale from 1 to 10. Thankfully, the hubby has diligently considered all the options and costs and ordered as he deems appropriate. Stay tuned for future updates. Things are happening quickly now! You Might Also Like: Log Rhythms: The Log-Raising! and Log Rhythms: Finally, Sunshine! This entry was posted on Thursday, June 23rd, 2016 at 12:43 pm and is filed under Log Rhythms. You can follow any responses to this entry through the RSS 2.0 feed. VERY NICE! Looking forward to enjoying the place!